With 120 state parks, 3 national parks, 2 national monuments among others, nature is definitely abundant in the state of Washington, USA, rightfully nicknamed the “Evergreen State” for its evergreen forests. When I visited Seattle back in September, it wasn’t just to eat my way across the city. My family and I also went on a road trip for four days to explore more of the state. 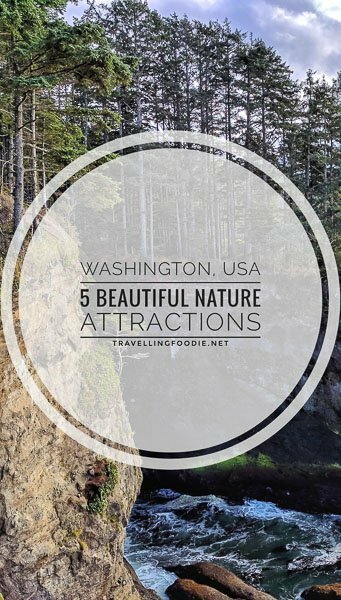 There are so many things to do in Washington, so we focused this trip more on nature. And if you were following along on my Instagram, they were breathtakingly beautiful even with limited hiking involved! A trip to Washington is not complete without visiting the Mount Rainier National Park. At 14,410-feet, the majestic Mount Rainier is one of the tallest peaks in the USA, and the most glacieted in contiguous USA. Travelling Foodie Tip: The Henry M. Jackson Visitor Center is a good place to start. It already has amazing views of Mount Rainier, and has trails that start from there. This national park is good for non-hikers because there are a lot of overlooks. Aside from mountains and trees, there are waterfalls as well. The Narada Falls is a popular stop because of its two tier waterfall drops. Did you know? The name of the falls, Narada, is the Hindi word for “pure”. Travelling Foodie Tip: One spot that will give you the best views without much effort is at Reflection Lakes. There is a small trail joining two separate parking lots for Reflection Lakes, which will showcase different reflections and sceneries. The northwestern most tip of contiguous USA, Cape Flattery is in the northern tip of the Olympic Peninsula. This is a must visit, and it only needs little work but offers big rewards. The trail is nice and short, and takes around 30 minutes. The first viewing platform gives you a nice view of the south side of the point, giving a glimpse of the beauty that’s yet to come. Continue the trail to the end, you’ll see two levels. Stay on the ground level to see the sea caves up close. Climb the step ladder to the second level, and be in awe of the panoramic view! Located in Olympic National Park near Port Angeles and Sequim, Hurricane Ridge offers some of the best scenic drives in Washington. At the end of the road is the visitor centre, where you can get brochures, maps and snacks, take a washroom break, or ask tips from the park ranger. With the visitor centre located 5,242-feet high, you can already see the panoramic views of the Olympic Mountains, the mountain range made of basalts and sedimentary rocks. Unfortunately, it was so foggy to see anything when we went. Even then, the foggy overlooks were still beautiful. One of the most popular beaches in Washington, Ruby Beach is known for its ruby-like sand and large sea stacks (rock islands). To get to the beach, you need to do a short hike from the parking lot. Travelling Foodie Tip: Flip flops or shoes are recommended. Though it’s a short hike, it becomes tough due to big rocks and large drift woods surrounding the beach. Located entirely within Olympic National Park, Lake Crescent is a deep lake that is glacially carved. This lake was isolated from Lake Sutherland due to a massive landslide 7,000 years ago. Did you know? Lake Crescent is Washington’s second deepest lake. How many of these places have you been to? What is the best nature attraction in Washington for you? Posted on December 13, 2017 January 1, 2019 by Travelling FoodiePosted in Travel, USA, WashingtonTagged guides, nature. I also explored these all fabulous places in my these tours and have a joyful time with my family and friends. I hope your shared information would be useful for all visitors which who have a plan to go there in coming up days. Thank you so much! I wish I had more time explore more! This just means I have to visit again. Yes, I do hope visitors find them useful! That’s the kind of articles I’m hoping to share here. If you have any feedback on how it can be better, please do let me know.